Everyone has their favorite cut of beef when they visit a Dallas steakhouse, but many people may not understand what makes their favorite order so special. When perusing the dinner menu, there always seems to be an assortment of cuts and chops of beef that catch the eye. Although these cuts all have different names, the idea of steak may blend together to the average steakhouse visitor. A steak is something that needs to be savored and appreciated for the cut of meat that it is. Understanding where the cut comes from is the first step to obtaining the proper knowledge needed in order to enjoy a delicious, Dallas steakhouse meal. Here are some of the most popular cuts that people order and where they originate from. This cut is known by this name or as the Bottom Round London Broil/Western Griller. This is a lean cut of steak that comes from the Round portion or tail-end of the cow. This cut usually has very little fat and is a tough cut because of the constant use of the cow’s legs. These cuts of steak usually come quite large and are best eaten when they are braised or roasted. Keep track of how long you cook this cut because it can dry out easily due to its lean demeanor. For the best taste, try this steak out with a fine, red wine. 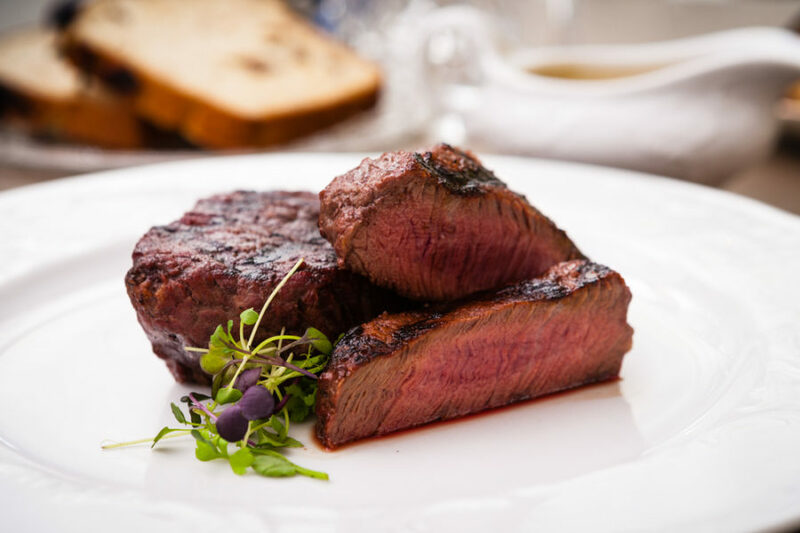 Known commonly as the filet, fillet, tenderloin filet, or tenderloin steak, this is the cream of the crop for many steak eaters. As the most tender beef cut, the filet is lean, succulent, and elegant. It is located in the Loin area of the animal and comes in an extremely compound cut. The cut specifically comes from the hindquarter of the cow, directly behind the ribs. This cut of steak is known for its melt in your mouth taste and is best cooked over a grill on a dry heat. The famed sirloin also comes from the Loin area of the cow. However, this is a more family-sized cut of steak that is substantially larger in size than its filet cousin. The sirloin steak is often lean, well-flavored, and when cooked excellently by a Dallas steakhouse is a tender beef at an affordable price. When you bite into this cut you will be met with no bones and very little fat. The sirloin is a traditional cut that many steakhouse guests turn to because it is so reliable in its taste and flavor. If you are visiting the Dallas metroplex and find yourself craving a delicious steak from one of the best restaurants in Dallas, look no further than the doors of Y.O. Ranch Steakhouse. We have an assortment of meals on our menu and are proud of the presentation that we put on each plate for our customers. If you have a favorite cut of steak, we most likely serve it and serve it to your tastes. Give us a call today to make a reservation.